In collaboration with Clark Thenhaus - Endemic Architecture. The Lake Side Resort Design Competition brief required the design of holiday resort on Changzhou’s new ‘West Lake’ development. The project was to be considered as an integral component of the new large-scale development, and as such was to contribute to the ecological, economical, and social qualities of the proposed master plan. The dense brief included a hotel, private villas, private apartments, a clubhouse, and the necessary supporting services. Strict physical requirements where to be met that defined building envelope heights, street and water frontage amenity, and density. 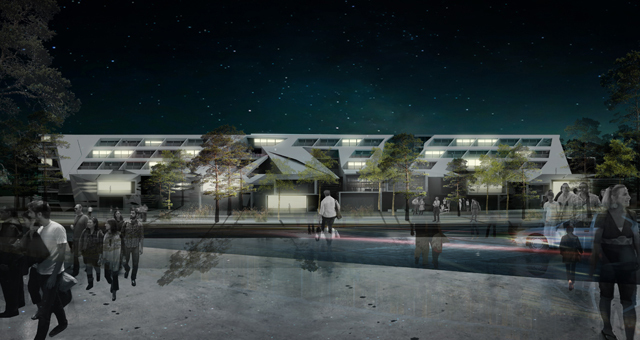 Unique, sustainable and intelligent submissions were sought in response to this competition. An assemblage of independent parts was proposed in place of the single conventional mass building type, and therefore generating a range of interesting identities specific to their program and the site.